Today, I introduced to the Senate to two distinguished members of the Groveland Police Department - Detective Steven Petrone and Officer Daniel Richmond. On Saturday, December 16th, Detective Steven Petrone and Officer Daniel Richmond engaged in a lifesaving act of heroism which involved extracting an unresponsive driver from her vehicle. 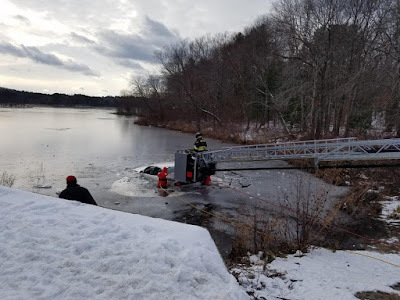 The car had submerged into and through the frozen waters of Johnsons Pond. Upon arrival, and without hesitation, Detective Petrone jumped into the frozen waters to remove the female driver from the car. Officer Richmond then helped pull the driver across the ice to shore and safety. They were accompanied in the Senate Chamber by Chief Jeff Gillen and Lieutenant Dwight McDonald. Also in attendance was Detective Petrone’s wife Kendra Petrone, his father Len, his mother Sandra.